WWonder Woman: Earth One was promised to be a “completely new version of Wonder Woman” while taking inspiration from the good ol’ days. When I saw the cover, Diana bound by chains with a look on her face that said “screw you all,” I knew that promise was going to be delivered. Grant Morrison, creator of some of DC’s best comic book runs, teamed up with his Batman Incorporated co-conspirator Yanick Paquette to undo the damage that Meredith and David Finch have inflicted on the regular monthly title. The beginning shows Hippolyta kneeling, bracelets chained by every Wonder Woman fan’s favorite man to hate: Hercules. He has caged the Amazons, and demands that their queen declare herself inferior. Hippolyta opens her mouth and…well… Three millennia later, we’re introduced to Paradise Island and its many technological advancements, including the famed Purple Ray (may the fangirling commence). Princess Diana is brought before the queen in chains, accused of breaking the Amazons’ most ancient laws. This is Diana’s trial, and only witnesses from Man’s World can save her from the guilty verdict. While everyone knows the classic story of Diana tricking her mother into allowing her to go to Man’s World, this is a legitimate spin on the concept, especially with the suspense from knowing that this has somehow led to her trial. Paquette must have had fun with the illustrations; his typical style combines with really fun character designs (bonus points for Hippolyta’s outfit). 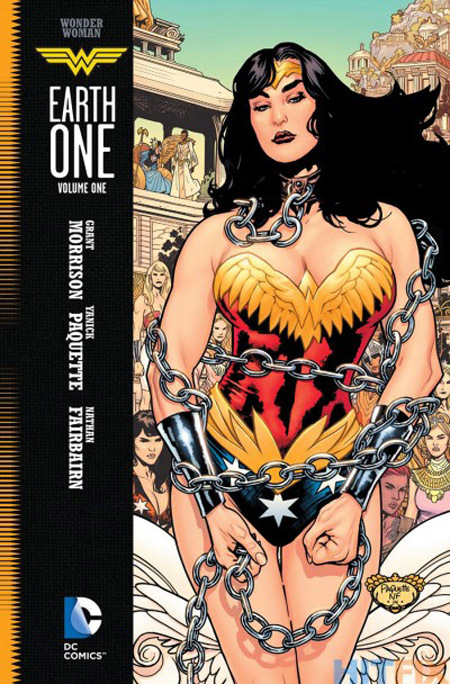 As for Morrison, I wouldn’t call this his best work, but if you’re a die-hard Wonder Woman fan, you need to read this. Diana’s got her edge back, and we’re ready for more.